One of this decade’s most awe-inspiring exhibitions comes alive at the majestic KL museum of Ahmedabad, after travelling to Mumbai and Delhi. Experience Parekh’s rendition of ‘Last Supper’, his surreal depictions of Varanasi, his stirring critique of the Bhagalpur Blindings and more, at the KL Museum now! 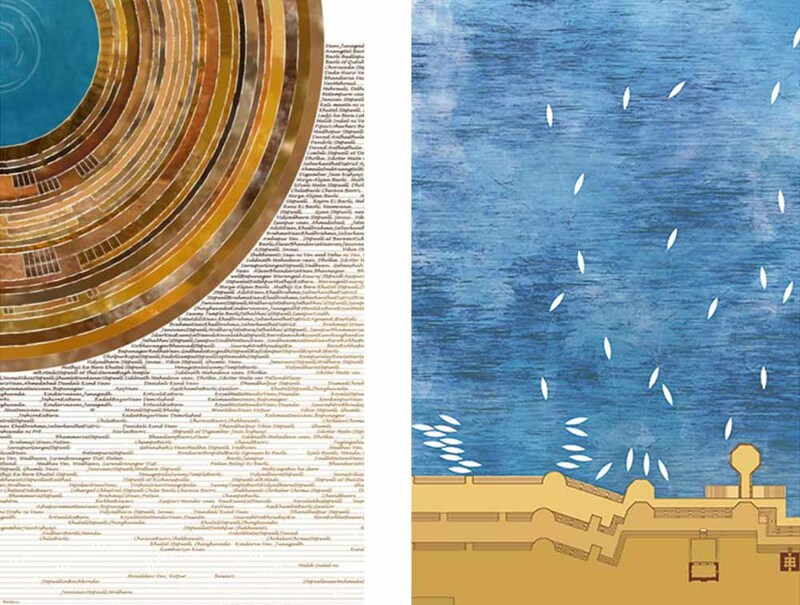 ‘Manu Parekh – 60 Years of Selected Works’ is an extensive and stirring retrospective. 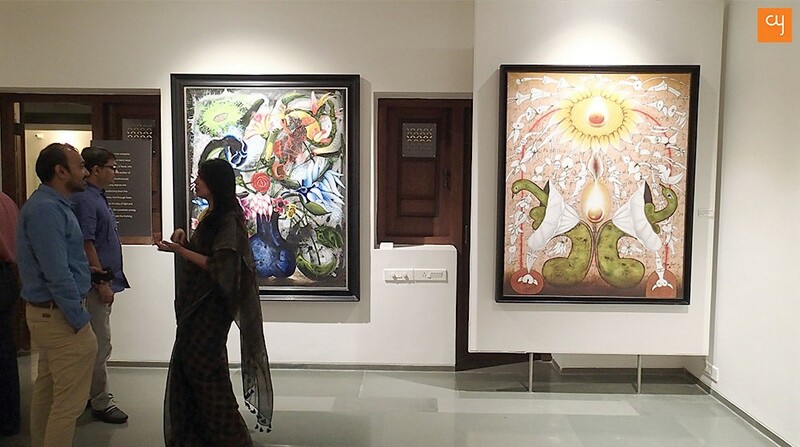 On a particular sun-drenched day of April this year, Padma Shri Manu Parekh was busy hosting his retrospective at the National Gallery of Modern Art in Mumbai, when he had a longing to bring his collection to Ahmedabad, the city where he was born. 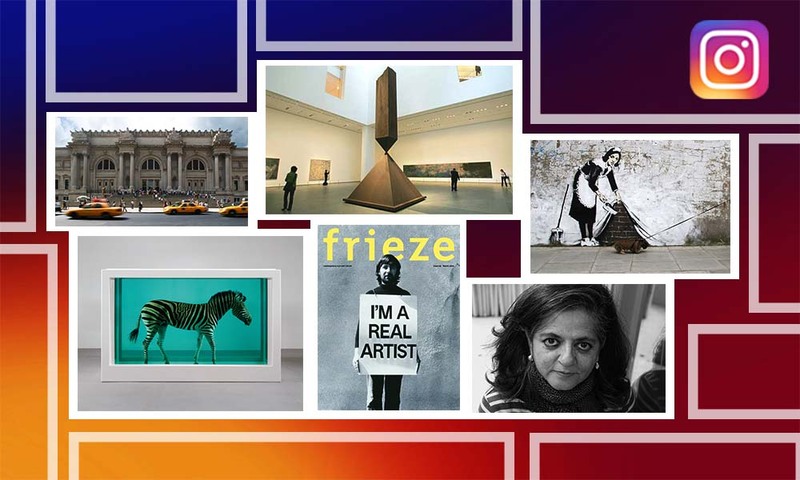 As luck would have it, art connoisseur Jayshree Lalbhai happened to meet him. When Parekh explained this wish to her, with hesitation that there may be no apt venue in the city for his massive collection, Jayshree Lalbhai advised him to visit the Kasturbhai Lalbhai Museum, of which she is the founder. 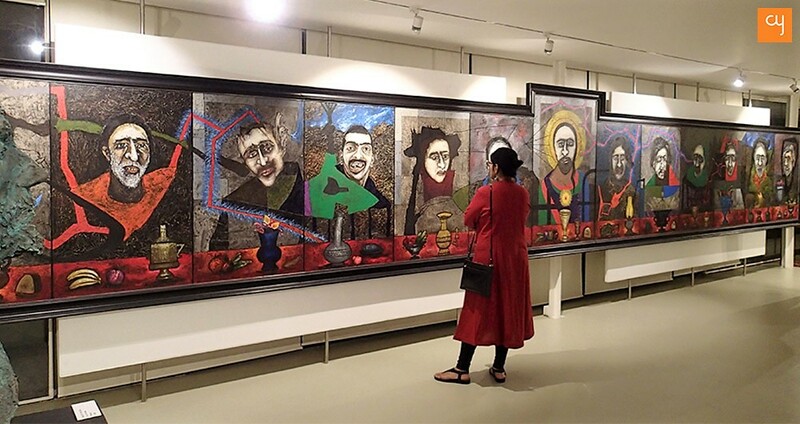 Parekh immediately left the exhibition to fly down to Ahmedabad, visited the gallery in the early hours of the morning, finalised a plan to bring the exhibition to the majestic KL museum, and flew back to Mumbai within sunrise. 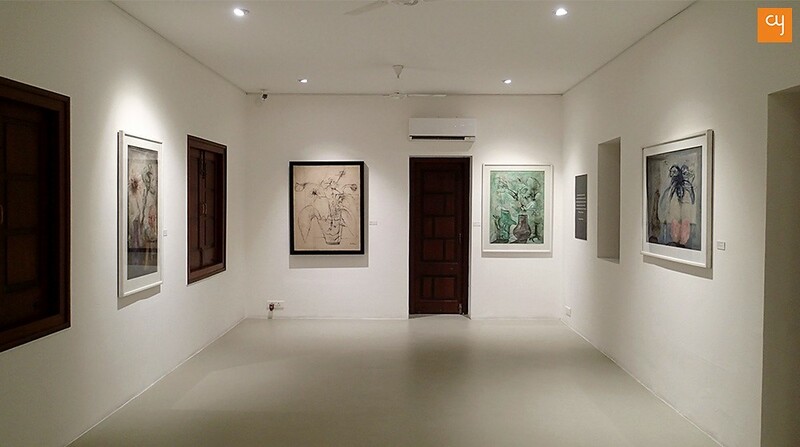 That’s how spontaneously the exhibition Manu Parekh –60 Years of Selected Works reached the KL Museum of Ahmedabad! 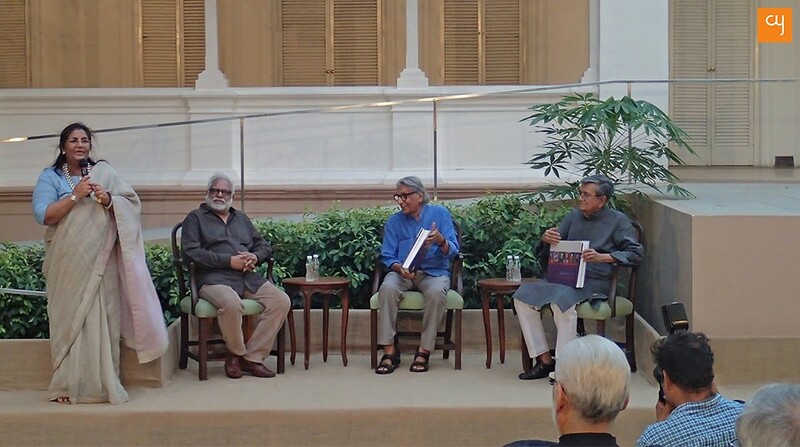 On May 4, for the launch of Parekh’s book by the same name as the exhibition, the who’s who of Ahmedabad’s art fraternity arrived at the museum. The stage was taken up by the Big Three creative pundits of the city–Pritzker winning architect Balkrishna Doshi, Kailash Lalit Kala Award-winning artist Amit Ambalal and the man of the evening, Manu Parekh. The evening’s discussion shed much light on Parekh’s life and techniques. Made in collaboration with the Union Ministry of Culture, the book consists of details of more than 250 works by Parekh. 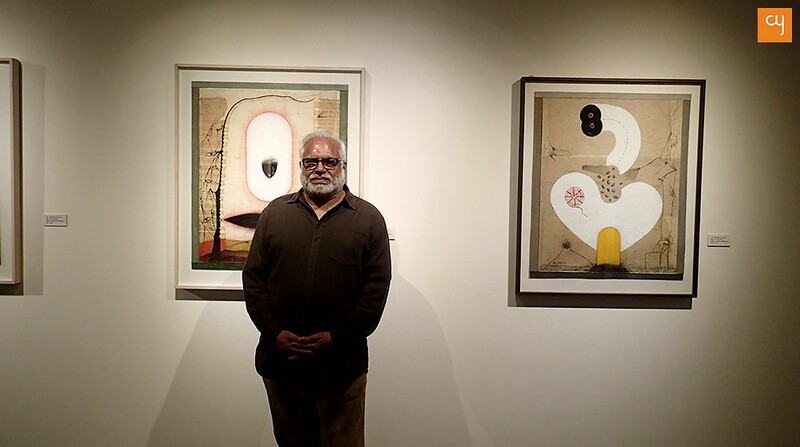 The exclusive retrospective is so massive that it gives onlookers a real opportunity to get under the skin of Parekh and comprehend his six-decade-long art voyage, in terms of his evolving aesthetics. 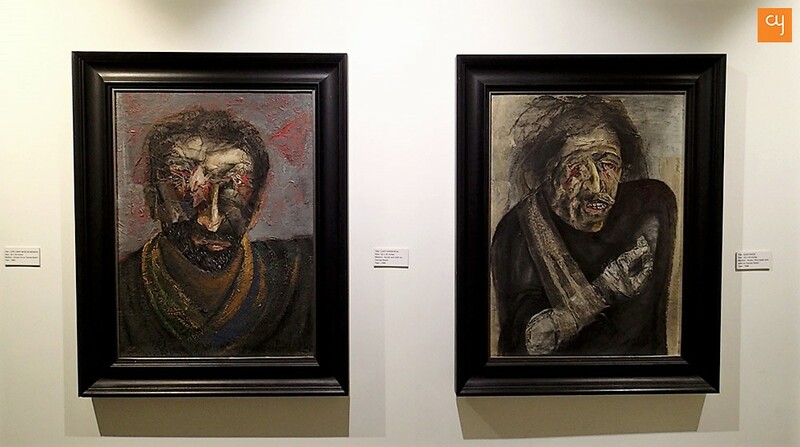 With an exhaustive collection of around 130 artworks, the exhibition has been meticulously segregated into different gallery sections according to the phases of his art’s evolution. 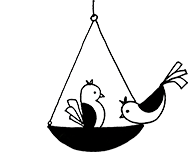 If you are planning to walk through all the 130 eloquent artworks in a single visit, make sure you have had a substantial meal to keep up with the exhaustive collection! Last year, Parekh had once recounted to me that he had been deeply moved on witnessing two cheetahs hunting a deer in Africa. The experience had prompted him to create a series of sketches of animal heads in graffiti style. Amongst the artist’s early works displayed in the basement gallery of the museum, one particular cruel-looking animal face straight away holds the attention. Its facial expression simultaneously portrays a fear of death, mixed with a semblance of cruelty that can only be possessed by a killer. Other abstract faces and shapes welcome onlookers here, taking them on an extended tour through surrealism. The artist’s other early watercolour and acrylic works seem to have drawn inspiration from the tribal art of India. These works were made primarily during a 25-year-period when Parekh contributed as a Design Consultant to the Handicrafts and Handlooms Export Corporation of India. Prior to this period, he had also interacted first-hand with cultural activist Pupul Jayakar who strove to revive traditional arts and crafts. Parekh’s realistic figurative forms, such as are seen in The Dancer painting, his lined human anatomies, Devanagari scripts, and his abstract shapes demonstrate a folk influence that celebrates fertility and life. This section of the exhibition also houses the art pundit’s original sketchbook, which people can skim through. Manu Parekh is one of the few artists in India to have been influenced by the artists of Bombay Progressive Artists‘ Group, having spent a significant amount of time in his early years observing FN Souza‘s artworks on the disruptive conditions of society. He also studied works on the India-Pakistan partition by Padma Vibhushan artist Satish Gujral, who was an alumnus from his alma mater Sir JJ School of Arts. 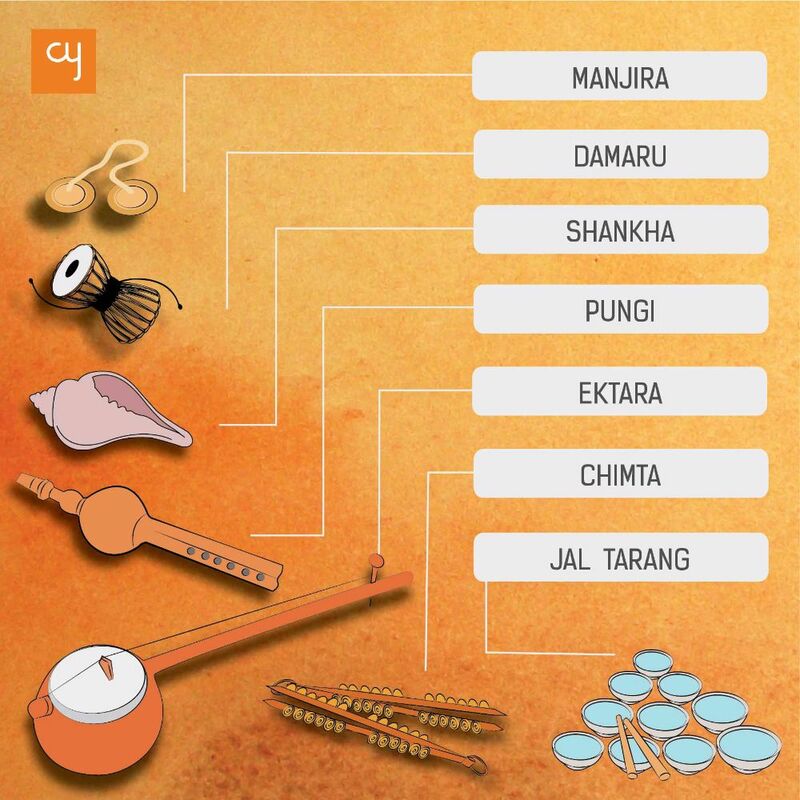 Across the ages, Varanasi has remained one city that has been explored by various artists from across India. But Manu Parekh’s stellar depictions, through his dreamlike portraits, are by far unmatched. 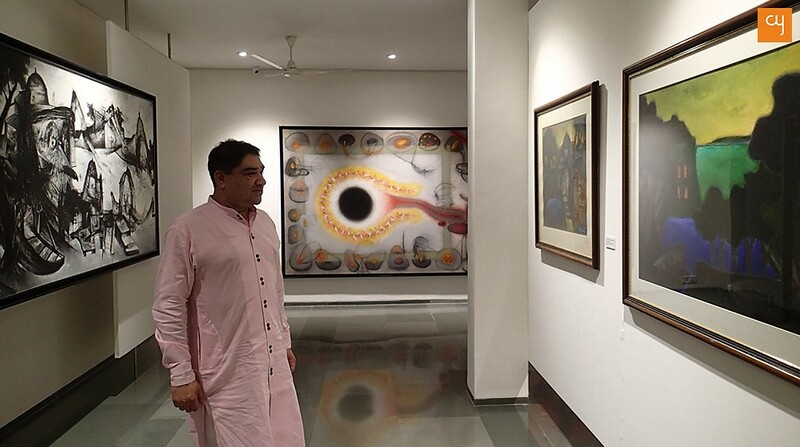 Last month, while looking at the surreal paintings of the saintly city made by India’s foremost abstract artist Ram Kumar at the Hutheesing Visual Art Centre, I gained a keen sense of its spatial quality. Ram Kumar’s spectacularly multifaceted strokes described the geometry of the ghats and the structure of the shrines in the holy city. So, this time round, when I glanced at Varanasi through the eyes of Manu Parekh at the Claude Batley House, I felt like I had been transported into the city once again – this time, through life-sized and mystical horizons that described the city’s geography. I saw otherworldly objects flowing in multiple dimensions across canvases. Numerous dark-toned temples described the spiritual rituals of the Garbhagriha. The brightly coloured ghats seemed to exist as if to reflect the tranquillity of the skies in the water of the Ganges. Colossal flowers rose beyond the landscapes, their petals flowing like swans. These fantasy objects seemed to express the drama and vigour of the place, over and above its visual loveliness. Also situated in the Claude Batley House is Jayshree Lalbhai’s most favourite collection of Parekh’s famed flowerpot paintings made on rice paper. She explained why this collection is her favourite, “The 32-feet long Last Supper painting may be striking and bold, but everything is incomparable to the soothing tones of Parekh’s flowerpots. Parekh’s thought process behind most of his works has erupted from his personal experiences. He saw the painful condition of the victims of the Bhagalpur blinding case and he witnessed that kill in Africa. His artworks are stirring and even poignant sometimes, but when I look at the flowerpots, which are also a part of my own collection, I feel satiated.”Many people have called these paintings as Indian versions of Vincent Van Gogh’s flowers. Flora being an integral component of worship in India, Parekh’s poetic and free form flowers take observers on a meditative, spiritual trip.”There is no geometry in his art, his force of lines possesses freedom,” remarked BV Doshi, who is a fast friend of Parekh, aptly at the book launch. Parekh’s choice of soothing and monochromatic colours is reminiscent of the aesthetic patterns of the Bengal School, which are known to have influenced Parekh during his time at Shantiniketan. Already feeling energetic from the experience of the exhibition so far, my exuberance reached its peak when I reached the uppermost glass gallery of the Claude Batley House, designed by architect Rahul Mehrotra. Here, I was immediately met by the sight of a 32-feet-long painting of Last Supper. Parekh had once shared with me that his inspiration to make this enormous picture had come from seeing his wife Madhvi Parekh’s spiritual drawings, which she usually exhibited at various cathedrals. But today, he revealed to me another secret, saying, “Though this has been meticulously framed to look like a single painting, these are thirteen different paintings that have been combined to make one.” Hearing this and looking at the mammoth painting again, I had a jaw-dropping moment. I had never imagined that an artist would be so inspired by the world’s most recognisable painting to turn it into an artwork imbibed with the flavour of India. Parekh has entirely recreated the 15th-century masterpiece made by Leonardo Da Vinci. The faces of subjects are incredibly animated, with the painting’s dark tones lending a unified semblance to the 13 paintings. Bronze relief sculptures of Jesus Christ are elegantly placed on either side of the painting, heightening the sacred aura of the gallery. Moving through the 13 individual works of Last Supper will give you a sentience of agony. And this feeling of pain doesn’t end here. One becomes witness to the barbarianism that human beings are capable of through Parekh’s immensely stirring Bhagalpur Blindings series, housed in the same gallery. Evoking the 1979-80 case in which 31 people were brutally blinded with acid by policemen in Bihar, Parekh’s paintings show the wounded flesh of the eyes of victims, and faces burnt with acid. These leave a permanent imagery on the mind. Last Supper and the Bhagalpur Blindings mark, according to me, the pinnacle of Parekh’s aesthetic understanding. Manu Parekh’s retrospective is an ocean of emotions that unfailingly connects with every viewer. As artist Amit Ambalal, who knows Parekh since more than three decades now, said at the book launch, “Hussain once told us not to think before experimenting in a work. 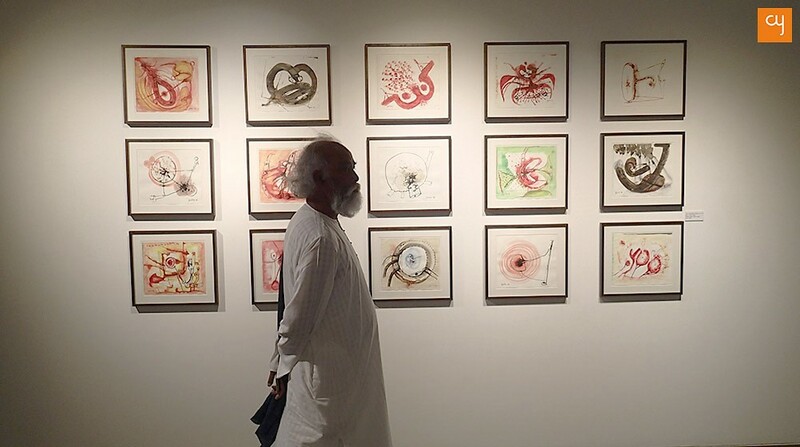 Now, remembering his words, I can see the bravery of experimentation in Parekh’s every painting.”The retrospective is indeed like a walkthrough of Parekh’s brain, in which realistic, folk, surrealist, figurative and pure abstract forms all pop out sequentially like a myriad thoughts housed all under a single roof. 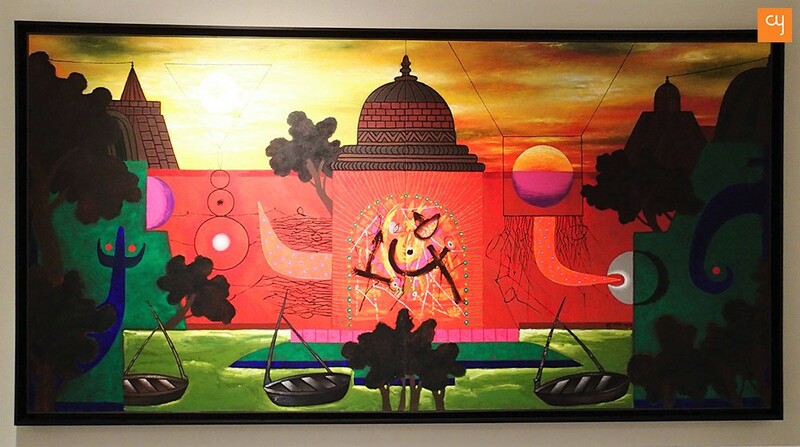 These exploratory ideas of Parekh will encourage artists to widen their thought processes. The retrospective is open for all at KL Museum until June 3, every day from 10 AM to 5 PM, except on Wednesdays. Even calling it a ‘must-see’ show would be an understatement here!